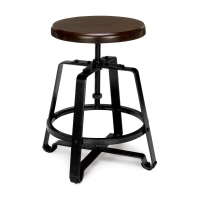 Simple, practical, and comfortable, OMF Endure Stools offer cool retro style, complete with spindle height adjustment. They come in two heights and your choice of Maple, Walnut, or Metal seats. 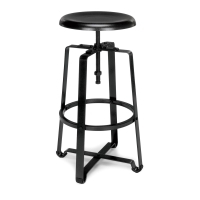 The frames are crafted of industrial-grade, 3 gauge, powder-coated metal and handle a hefty 250 weight capacity. Rubber floor bumpers assure stability and protect floor surfaces. The wooden seats are made from solid, genuine hardwood and have a polyurethane coating for protection. 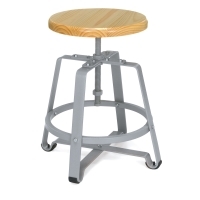 The metal seat is made from 14 gauge metal. All offer complete 360° rotation with a locking nut for stationary positioning.